Tahoe Production House recently wrapped production on a Video project for the Tahoe Resource Conservation District regarding the acquisition of the Barton-Johnson Meadow. Johnson Meadow is situated in the heart of the city of South Lake Tahoe, El Dorado County, California. It is located within the Upper Truckee River watershed, the largest watershed in the Lake Tahoe Basin, draining over 56 square miles and providing some of the most significant wet meadow floodplain habitat in the entire Sierra Nevada. Tahoe RCD recently acquired title to approximately 206 acres comprising the Johnson Meadow property in order to provide continuous public ownership of the lower nine miles of the Upper Truckee River (UTR) before the river enters Lake Tahoe. This nine-mile reach of the UTR is centered downstream of property owned by the City of South Lake Tahoe and California Department of Parks and Recreation (Washoe Meadows State Park) and upstream of the Upper Truckee Marsh, owned by the California Tahoe Conservancy. Johnson Meadow is situated in the floodplain of the UTR and was the largest privately-owned meadow in the Tahoe Basin. Johnson Meadow was used as a dairy to produce cream and milk following the Gold Rush (1850s) and was purchased in the 1920s by the Mosher family. The dairy equipment was moved out of the meadow in the 1930s and the dairy operations ceased. From the 1930s, the meadow was used for summer cattle grazing. Acquisition of Johnson Meadow is a critical step in restoring the UTR watershed, and this river reach contains significant wildlife habitat, including river, riparian, meadow, and upland habitat areas. 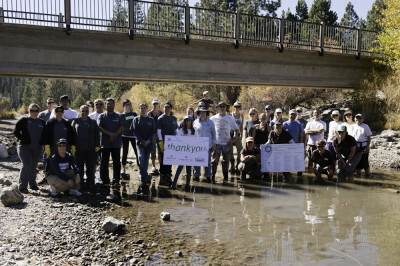 Acquisition was made possible through funding from California Tahoe Conservancy, California Department of Fish and Wildlife and the Tahoe Fund. The purpose of this land purchase is to provide ecosystem and watershed protection benefits through preservation, management, and future restoration of meadow, riparian, aquatic and upland habitats in Johnson Meadow. The Tahoe RCD plays a critical role in addressing the most important natural resource concerns and opportunities in the basin, from preventing and eradicating aquatic invasive species from the lake, to helping communities mitigate the risk of fire. The mission of the Tahoe RCD is to promote the conservation, stewardship and knowledge of the Lake Tahoe Region’s natural resources by providing leadership and innovative environmental services to all stakeholders. The Tahoe RCD is a flexible and adaptable organization that can serve as a link between public and private interests related to this property. Additionally, the Tahoe RCD has extensive experience in natural resource management and will ensure that this unique property with sensitive habitat is properly restored and managed for generations to enjoy. To learn more, check out the video, and visit the Tahoe RCD Website HERE! The Tahoe Resource Conservation District (Tahoe RCD) is one of nearly 3000 Conservation Districts across the country helping people protect land, water, forests, wildlife, and related natural resources. The California State Legislature formed the Tahoe RCD in 1974 under Division 9 of the California Public Resources Code. The Tahoe RCD is a non-regulatory, grant-funded, local agency that works in the Lake Tahoe Basin. The Tahoe RCD, along with our many partners, obtains grant funding and private donations to support all aspects of conservation issues which include, but are not limited to: water quality, wildlife habitat, fire defensible space, sustainable recreation, water conservation and community enhancement. Current programs at the Tahoe RCD focus on stormwater management, aquatic invasive species control and prevention, land management, forestry and conservation landscaping initiatives.